Our feline companions are much-loved but often mysterious. 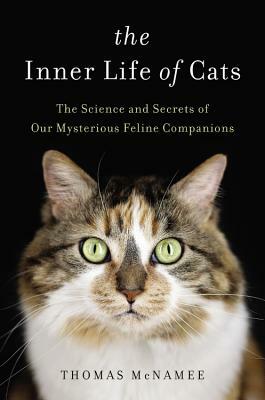 In The Inner Life of Cats, Thomas McNamee blends scientific reportage with engaging, illustrative anecdotes about his own beloved cat, Augusta, to explore and illuminate the secrets and enigmas of her kind. As it begins, The Inner Life of Cats follows the development of the young Augusta while simultaneously explaining the basics of a kitten's physiological and psychological development. As the narrative progresses, McNamee also charts cats' evolution, explores a feral cat colony in Rome, tells the story of Augusta's life and adventures, and consults with behavioral experts, animal activists, and researchers, who will help readers more fully understand cats. McNamee shows that with deeper knowledge of cats' developmental phases and individual idiosyncrasies, we can do a better job of guiding cats' maturation and improving the quality of their lives. Readers' relationships with their feline friends will be happier and more harmonious because of this book. Thomas McNamee is the recipient of a 2016 John Simon Guggenheim Foundation fellowship. He is the author of The Grizzly Bear; Nature First: Keeping Our Wild Places and Wild Creatures Wild; A Story of Deep Delight; The Return of the Wolf to Yellowstone; Alice Waters and Chez Panisse: The Romantic, Impractical, Often Eccentric, Ultimately Brilliant Making of a Food Revolution; The Man Who Changed the Way We Eat: Craig Claiborne and the American Food Renaissance; and The Killing of the Wolf Number Ten. He wrote the PBS documentary Alexander Calder, which won a Peabody Award and an Emmy. He lives in San Francisco.